After dinner last night, I was emptying the dishwasher and I asked Brett to help me. He grabbed the silverware to put away and started with the knives that belong in the knife block. My back was to him at this point and a minute later I heard a huge crash and he was all “Holy Crap”. I whipped around to determine the level of emergency response needed. That’s when I saw that he had pulled the entire silverware drawer out from the cabinet and broken the runner off. Ya know, the important piece that guides the drawer on its track. Seriously, are you strongman now? 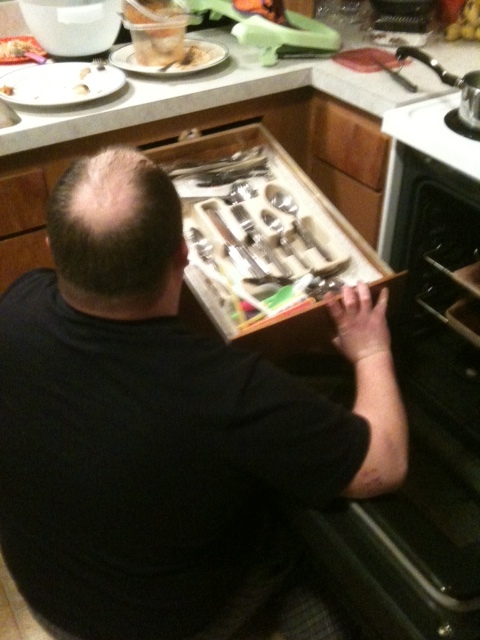 Is it required that we pull the silverware drawer out with such brute force? 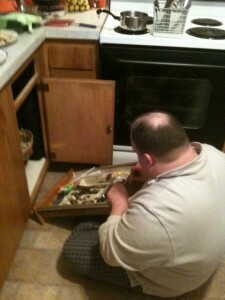 I shook my head as I continued to empty the dishwasher and he attempted to re-attach the runner. The runner had been held in place by really large staples, like 5 of them. They were huge and, I imagine, placed there when the cabinet was first constructed by a pneumatic gun. Here was strongman, trying to re-attach the runner by pushing the staples back in…..by hand. Listen Lady, I’m pretty sure this approach is not going to work unless you have steel hands. I suggested he may want to try a hammer to complete this handiwork, but was told “quiet woman.” After a few more attempts with his hand, he resided to the fact that he may need assistance from a tool. Not that I was right or anything. The hammer did the trick and two shirts later, he had re-attached the runner. “Somehow” both shirts got graphite dust on them during this process. Lady, it looked something like a contortionist, wriggling all over my kitchen floor in attempt outwit the staples. Then came the tricky part. Finagling the runner back on so that the drawer closes smoothly. As you can see this was quite the process. He was convinced that he needed to open the oven door so that he could properly get the runner on the track. 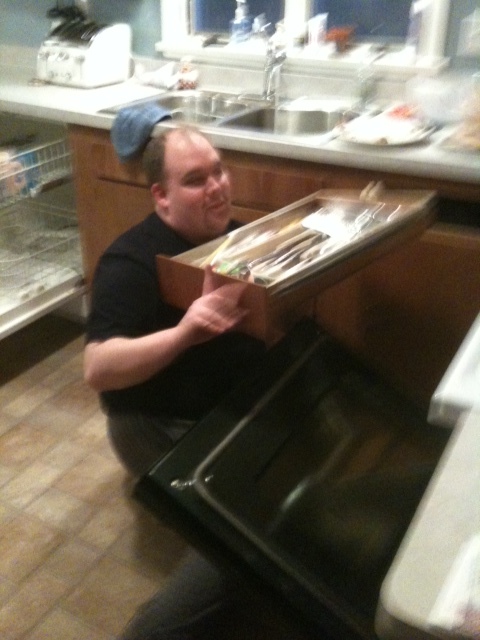 At one point I think Brett may have moved the refrigerator to gain better access….and the fridge is way on the other side of the kitchen. The best part of this whole debacle is that he did not know I was taking pictures until the very end. This last photo is blurry, but his facial expression is just priceless. When he saw me with the camera he started saying “NOOOOOOOOO” and turning. As if that would deflect my picture taking.